Essential Tips for Winter Camping - Find a camper or RV now! No worries, you don’t have to be Nanook of the North to enjoy camping’s forgotten fourth season. You just have to be prepared with the right knowledge and the right gear. Remember those no school snow days when your parents would bundle you up and send you outside to play? Well, winter camping can be just as fun as that. So shake off those blues and blahs and say hello to the majesty of the winter wonderland and all of its beauty. From frozen lakes and rivers to conifers blanketed in snow, winter offers a different perspective on the outdoors and on camping. Don’t be surprised if you come back from a winter camping experience yearning for more. Just make sure you follow these important tips for enjoying the great outdoors in camping’s forgotten fourth season. Shelter: If you are car camping or backpacking it is more than advisable that you use a 4 season tent. Winter temperatures can change dramatically and quickly and winter storms can appear out of nowhere, so you want to have a shelter that is designed to handle the winter elements and is big enough that should you have to hunker down you won’t get claustrophobic. RVs: If you are planning on using your motorhome or camper it is vital that your heater is in great working order, and your propane supply is more than enough to last for the length of your excursion. If you are at a campsite plugged into electricity you can run a space heater on electricity that your campsite fees have already paid for. There are A/C units for RVs that also have heat pumps like the Advent 13,500 BTU roof-top air conditioner with heat pump which sells for around $600.00 new on the internet. As well you need to make sure that you have taken the necessary maintenance steps to prevent frozen water lines. (See our article on RV Maintenance) Furthermore, you can set your RV up with heated water hoses as well as enclosed and heated underbellies if your model will allow. If all else fails, leaving unexposed waterlines trickling will prevent freezing. But make sure that they are insulated and unexposed to the outside elements, or you could slowly freeze them. Other important things to remember for using an RV for winter camping are to use caution when driving on icy or snowy roads, make sure your fuel and water tanks are full, and that you have the appropriate tires. Firewood: Having enough firewood if essential, so if you have the ability to bring your own, budget at least fifty percent more than you think you need. If you are backpacking and can’t bring firewood with you, make it a priority when you set up camp to collect firewood and get a fire going right away. (See our article on Building the Perfect Campfire) If you are at a campground or somewhere else that you can manage to bring a propane fire pit you can leave the firewood at home. Remember that some areas have restrictions on transporting firewood because of devastating bugs like the Emerald Ash Borer, so stay informed and protect the forests. Just because it’s winter doesn’t mean you can’t transport deadly pests! Fuel: If you have the ability to bring an extra camp stove do so, but don’t forget to bring extra fuel. If there is snow on the ground, an extra camp stove can be used to melt snow and make water, which you will need to consume more of at colder temperatures. Sleep: Your sleeping bag should be rated for at least the lowest temperature that you will encounter. 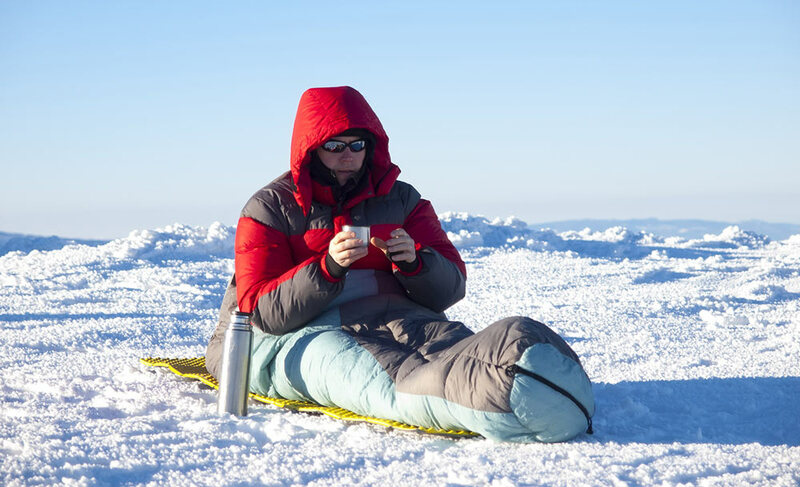 Warm your sleeping bag before getting in by using a hot water bottle. Using an extra foam pad to sleep on will help block cold air from the ground. Clothing: Layering is the best technique for winter clothing as you can shed clothing while hiking or in the sun and add clothing when resting or when the temps drop at night. Warm, waterproof boots, heavy moisture wicking socks, a good hat, and sunglasses, as well as a couple of great pairs of gloves are essential packing list items. If you are going to be somewhere sunny or at altitude, don’t forget the sunscreen. Just because it is winter doesn’t mean you can’t get sunburned. Food:Pack and prepare hearty meals as you will use and need more calories in colder temperatures. Chocolate can be a real morale booster in cold weather. Destination: Pick a location, campground, or trail that has more rewards than challenges. It should be more about enjoying what winter has to offer than proving yourself. Weather: Watch the forecast closely. Winter storms can be at their mildest a bummer and at their worst a dangerous force to be reckoned with. If you have advanced warning of a serious winter storm, postpone your trip until better weather presents itself. Caution: Use your noggin and stay off of any bodies of water that you are not 100 percent certain are frozen solid. Avoid avalanche zones entirely. Carry an emergency radio beacon. If you have read this article and paid attention to the essential tips provided there is no reason that you can’t have an experience as unique as a snowflake while enjoying camping’s forgotten fourth season. So this winter, do as your parents told you on those snow days of long ago and take it outside. Here at Campers & Gear we are always ready to help you in your endeavors to live outdoors, so whether it is by snowshoe or cross country skis make some tracks, catch a monster while ice fishing, enjoy the crisp air, and explore nature during its most unexplored time of year!